In this unique book, readers are taken on a journey to explore the role of the imagination in the face of mystery, whether it be the mystery of God, whose full reality lies beyond our earthly horizons, or the deepest mysteries of life hinted at in the work of fiction. By attending to a series of novels, Paul Lakeland proposes serious fiction as an antidote to the failure of the religious imagination today and shows how literature might lead the secular mind at least to the threshold of mystery. Paul Lakeland is the Aloysius P. Kelley, SJ, Professor of Catholic Studies and founding director of the Center for Catholic Studies at Fairfield University, a Jesuit institution in Connecticut. Educated at Heythrop Pontifical Athenaeum, Oxford University, the University of London, and Vanderbilt University, he has taught at Fairfield since 1981. He is the author of nine previous books, the most recent of which is A Council That Will Never End: Lumen Gentium and the Church Today (Liturgical Press, 2013). Lakeland is a member of the American Academy of Religion, the American Theological Society, the College Theology Society, and the Catholic Theological Society of America. He blogs occasionally and reviews fiction for Commonweal, a Catholic journal of opinion. "As both commentary and prescription for our times, The Wounded Angel offers a `theology of literature' that revitalizes religious imagination through the interaction with fiction. 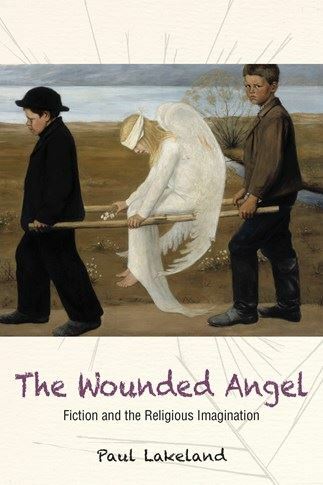 The Wounded Angel is itself a patient, thoughtful act of literary and religious imagination. It entices us with the rewards of deep reflection and invites us, through fiction or through faith, to slow down and attend to the mystery of the holy." "Lakeland offers us many opportunities to question and to disgrace, and I have filled the book's margins with objections and exclamation marks. More important are formulations that go to the heart of what is dear to us in great books." "Paul Lakeland claims that `the work of the creative artist is always somehow bumping against the transcendent.' What a lovely thought and what a perfect summary of the subtle and significant argument made in The Wounded Angel. Gracefully moving between theology and literature, religious content and narrative form, Lakeland reminds us both of how imaginative faith is and of how imbued with mystery and grace literature is. Lakeland's range of interests—Coleridge and Louise Penny, Marilynne Robinson and Shusaku Endo—is wide, and his ability to trace connections between these texts and relate them to large-scale theological questions is impressive. This is an essential read for those interested in the relationship between the religious and literary imaginations." "It is Lakeland's rightful conviction that much can be done today for the Catholic faith by attending to and healing our impoverished imaginations. Arguably, this can especially be realized through good fiction, whether or not it explicitly broaches religious themes. Seeking to yoke together two distinct fields of academic knowledge is a bold enterprise, and one that Lakeland is to be commended for." "Renowned ecclesiologist Paul Lakeland explores in depth one of his earliest but perduring interests: the impact of reading serious modern fiction. He convincingly argues for an inner link between faith and religious imagination. Drawing on a copious cross section of thoughtful novels (not all of them `edifying'), he reasons that the joy of reading is more than entertainment but rather potentially salvific transformation of our capacity to love and be loved. Art may accomplish what religion does not always achieve. The numerous titles discussed here belong on one's must-read list!" "Lakeland's book will enhance any reader's appreciation of the connections between faith and fiction." "The Wounded Angel considers the uses of so-called secular literature to convey illuminations of mystery, the unsayable, the hidden otherness, the Holy One. Saint Ignatius urged us to find God in all things, and Paul Lakeland demonstrates how that's theologically possible in fictions whose authors had no spiritual or religious intentions. A fine and much-needed reflection."